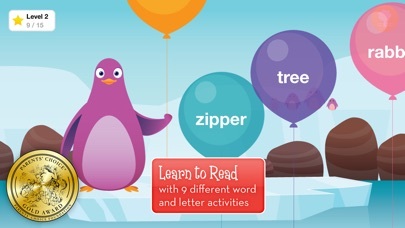 Kindergarten Reading offers entertaining activities to help young children learn letter sounds and spell simple words. 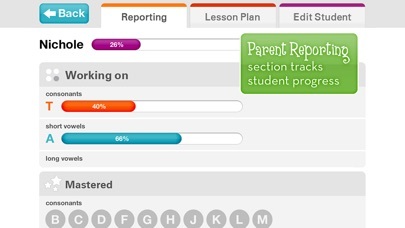 Parents and teachers will love being able to see detailed progress reports after children play with the app. Kindergarten Reading offers rewarding and pleasant practice with basic phonics skills, including letter recognition, beginning sounds, medial vowels, spelling consonant-vowel-consonant words and more. Graphics are simple, yet appealing and the activities require just enough eye-hand coordination to be challenging but not frustrating for young children. The app is easy for young children to use independently and entertaining enough to keep them occupied and coming back for more. Kindergarten Reading will get young readers started off on the right foot. It’s perfect for emergent readers from preschool through early elementary ages. The app begins by limiting the activities to a few very common letters, then gradually adds more variety. In the records section, parents and teachers can see exactly what letters are on the current menu and how the student is performing on the various types of activities. 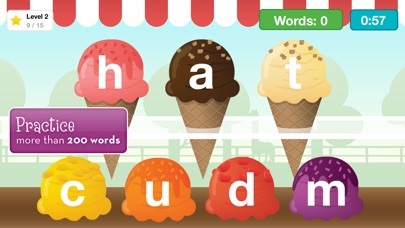 Children who use the application will practice letter recognition of lower case forms, letter sound correspondence, beginning sounds, medial long and short vowels and even spelling simple CVC pattern words. The system is designed to gradually increase in difficulty, adding to its value for students. 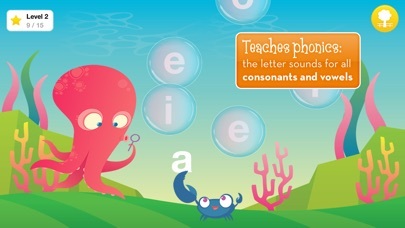 There are a variety of game formats included, including variations on a “feed the animal” theme, “pop the bubbles” and “give balloons.” Games get increasingly more challenging as students play, with answer choices presented at a faster pace or interspersing medial vowels and spelling tasks. One concern about the games was that distracters (incorrect responses) seem to fall into patterns. Some students may well cue into the fact that correct responses are often spaced with one or two distracters between them, allowing them to guess at correct answers instead of completing the tasks as intended. Having some sequences of three incorrect answers as well as correct answers sometimes coming one after another might help with this. Another way the software could be improved is with an option to return “home” in the middle of game play so that an adult could check progress or change students. The program allows for three sets of records, as well as a “guest,” and it would be nice to be able to switch between them without completely stopping and restarting the app. Kindergarten Reading is highly entertaining for its intended audience. Graphics are centered around a zoo theme, with different animals featured in the games. Each screen has different types of immediate rewards for correct responses, and completing five segments of the program is rewarded by a disco-dancing monkey and access to a new animal for the Zoo. There are six habitats to choose for the zoo, and new animals can be chosen after each program section is completed. Every fourth animal is a mystery, and will surprise students. With a total of 43 animals to unlock, children will have a lot of motivation to complete the exercises. The zoo (with existing animals) is accessible to students at any time, so they don’t need to wait until they’ve completed a specific amount of exercises, but they will quickly see that completing the activities unlocks new animals to use. This application will help students practice letter identification, matching, phonics and spelling skills in an organized manner, keeping records for up to three individuals. With nine different game formats, twenty-one consonant sounds, and ten vowel sounds to focus on, it provides many hours of educational play. The reward Zoo is also engaging and many children will want to play with that in addition to completing the letter exercises. 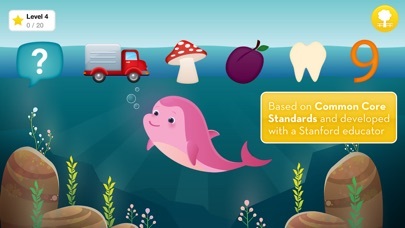 The app is well-suited to the task of providing additional practice for beginning reading skills. Kindergarten Reading was definitely created with young children in mind. Buttons and graphics are large and clear, and each activity’s directions are easy to understand and follow. The guide’s voice is a pleasant, happy female voice which should encourage young students to listen. There are no links to social media or the internet. The home page does contain a prominent link to other applications from the same company, and activating this link will open the App Store. This seems redundant because the Parents Section also contains links to the company’s other apps, and those links are not nearly so accessible to young children. It would be better to put this information solely in the Parents section, where young children are less likely to find it and try to make purchases by accident.